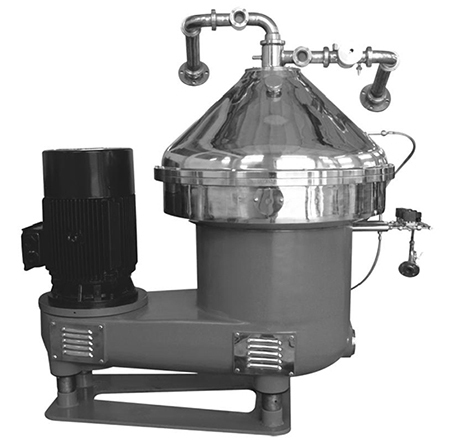 The decanter WZ from ProSoya is a continuously operating horizontal solid wall centrifuge. It is the superior choice for use in dewatering operations. It is ideal for use in the food industry in situations where the material being processed has to be separated into a liquid and a solids phase. New technology built into its design results in glitch-free, reliable operation, as well as energy savings, improved performance and greater efficiency. All parts coming into contact with the product are made of stainless steel. 3-phase AC motor for controlled torque starting via frequency converter. Highest g-force for higher solids output. Adjustable bowl speed via VFD. Belts for both primary motor and secondary motor. High ratio of length to diameter. The ACS3K & ACS8K separator incorporate the very latest developments in centrifuge construction. These are designed for intermittent discharge of solid, while separating suspension into liquid and solid, especially for clarifying in food and dairy industry. All parts in contact with the process liquid are made of stainless steel. The design conforms to international standards, and the machine is made in accordance with the general directives for this type of machinery. Separators with a self-cleaning bowl are used in the clarification of suspension. Clarifiers with a hydro-soft inlet have been developed for gentle product treatment and also particularly for ensuring that the particle fines which frequently tend to pulverize are feed into the separating chamber without being damaged. 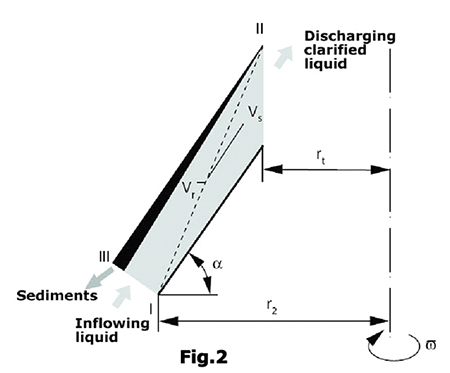 Fig.1 shows a self-cleaning clarifier in schematic form. The suspension to be clarified is feed into the disc stack (4) with a pump through the central inlet tube (3) and the distributor. The numerous individual separating chambers in parallel between the discs breaks down the product flow into many thin layers. The settling distance is accordingly minimized. A solids particle is considered to have been separated when it has reached the lower surface of the upper disc. The liquid flow is weak at this point. The particle is no longer captured by the flow, and instead it slides towards the periphery of the bowl under the influence of centrifugal force. 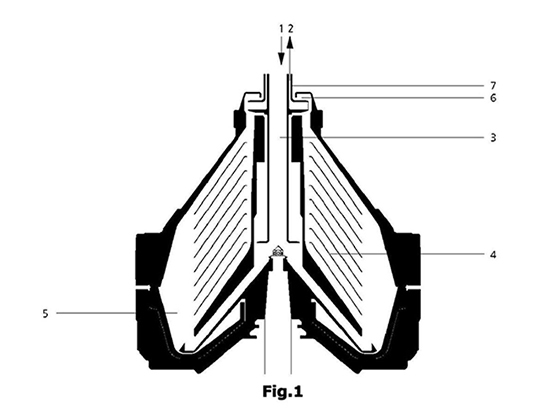 An individual separating chamber is shown in Fig. 2. It leaves the separating chamber at the end of the disc (III).Along the separating line (I-II), the smallest particle capable of being separated is guaranteed to be removed. The diameter of such a particle is known as the marginal particle diameter. The clarified suspension flows to the interior of the bowl and enters the centripetal pump chamber (6). The centripetal pump (7) discharges the clarified liquid under pressure out of the separator bowl. The solids move towards the periphery of the bowl and collect in the twin-conical solids holding chamber (5). The solids are discharged out of the bowl at definable intervals by way of a hydraulic system. The bowl discharges take place at full bowl speed. 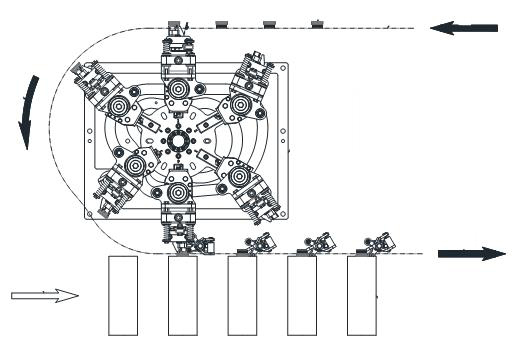 Picture shows a belt driven configuration used for larger centrifuges. Configuration and specifications are for reference only, and may change as the technology is improved. Each disc bowl centrifuge comes with control unit (PLC control panel), electric motor (Siemens/ABB), inlet and outlet connections, vibration-isolating base plate, set of erosion protective parts, spare parts kit and set of special tools for disassembly and assembly. The centrifuges are manufactured in compliance with ISO9001-2000. One year warranty is provided under normal use. Maintenance parts for one year are included. These are available in capacities ranging from 5,000 L to 20,000 L and higher, vertical and horizontal configurations. These are insulated and have dimple jacket in 15% to 30% surface are of the tank for cooling. One ort more stirrers are provided to maintain even temperature and keep the product inside homogeneous. Chiller is optional. ConTofu is a patented tofu curding system suitable for producing a variety of tofu curds. It has a continuous curdling system that heats or cools soymilk continuously to the curdling temperature, injects the coagulant in the gently flowing soymilk through a holding tube, and then partially removes the whey. The curd is now ready to direct to the tofu forming boxes and pressed Tofu curd is produced in this sanitary stainless steel system untouched by human hand. Ask for our VCT system that integrate soymilk and tofu curd making in a single continuous set up starting from soybeans. Available in capacities ranging from processing 100 – 600 kg of dry soybeans per hour. Smaller and larger systems can also be built. 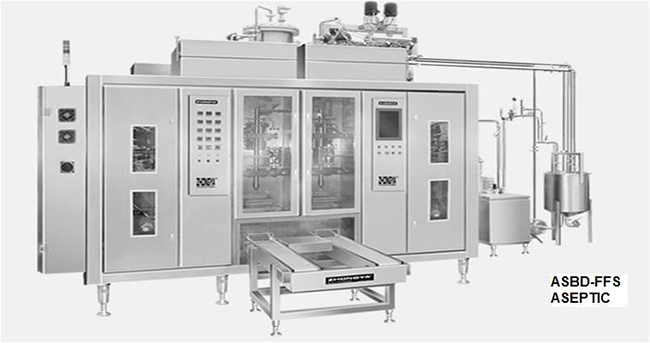 Automatic UHT sterilizers and HTST pasteurizers are manufactured in a range of capacities up to 20,000 liters per hour. These meet the European and American quality standards for operations throughout the world. We offer aseptic filling machines for filling UHT sterilized liquid food into sterilized laminated paper board packaging material in aseptic condition. The paper board is automatically and continuously formed into a center sealed tube that is filled, end sealed and formed into brick packs of desired capacities. 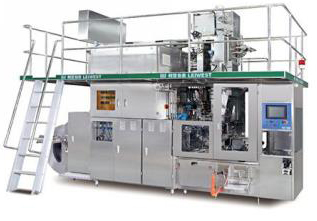 The machines are manufactured by our associate in China established by ex-engineers of Tetra Pak. The quality of these machines, including aseptic shelf life and operating performance, is similar to the international leading brands. One of the aseptic filling machine (FDA certified) is being installed at our Ottawa (Canada) facility for demonstration and trial run purposes. Machines use hydrogen peroxide as sterilization medium. The machines are offered for pack sizes 1000 ml base and slim, 250 ml base and slim, 200 ml slim, 125 ml slim and 100 ml base at present. NOTE: ProSoya also offers aseptic brick pack machines with 3000 packs per hour throughput for those customer with low production capacities. of plastic film sterilizing, pouch forming, aseptic filling of pre-sterilized liquid product, sealing and cutting, as well as pouch discharge from the machine, are all performed automatically. This ASBD series machines are suitable for the utilization of various multilayer plastic pre-printed and un-printed films and also for the aluminum-plastic, and paper plastic complex packaging materials. The machine uses key components from the world famous and most reliable manufacturers. These machines are stable in operation, high in efficiency sterilized product filling, and low in power consumption. These machines are the first choice for the production of long lasting aseptic product in many countries in the world. Advanced design of double stations independent aseptic chamber and pouch forming filling system is able to realize the production of two different sizes of pouches at the same time, or the independent operation of only one side. H2O2 spraying and high intensity UV sterilization and aseptic air displacement technology are applied in the aseptic chamber to guarantee the constant sterile condition in the aseptic chamber. The packaging material is sterilized by immersing and moving it a “W” pattern in a H2O2 tank. As it exits the H2O2 tank, it is dried by blowing aseptic hot air to guarantee the sterilization effect of the packaging material. 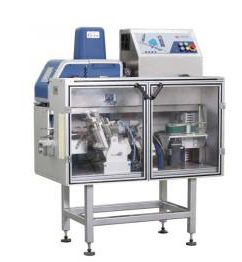 The sealing & cutting system is driven by the servo motor to guarantee the stability and high accuracy of its operation, and good sealing and cutting of the film. The state-of-the-art single station, two steps sealing and cutting device (patented technology), realizes the function of separate sealing and cutting within each station. This technology is suitable for various kinds of multilayer packaging films, including aluminum-plastic, paper plastic, and other complex packaging materials required to prolong the effective shelf life of difficult products. The integrated CIP and SIP systems guarantee the sterility of the pipes and valves which contact the material during the production. Three stage, fixed length draw technology is applied in packaging material drawing. The utilization of servo power transmission and photoelectric sensor locater guarantee the accuracy of the draw length and the wrinkle-free stretch of the packaging material that is suitable for the product pouches f various dimension. The machine is equipped with film splicing device for non-stop operation and date printing function. These are manufactured in capacities ranging from 250 L/H to 20,000 L/H, some up to 700 bar (10,000 psi) maximum pressure or 560 bar (8,000 psi) operating pressure. The pressure may be manually controlled, or hydraulically controlled. The rate of flow can be varied by using a variable frequency drive offered as an option. Used for extracting soymilk from cooked soya slurry and simultaneously for washing okara to obtain thin soymilk for grinding soybeans instead of water. Greatly improves soymilk yield. Capacities are suitable for 1000 L/H and 2000 L/H soymilk plants. These are fabricated in capacities ranging from 1000 L to 10,000 L and larger. 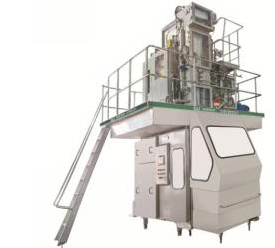 Insulated, jacketed, high-shear mixing and automated options are offered. The automatic and manual CIP systems are built in various capacities from 1000 L to 20,000 L, 2 tank and 3 tanks arrangements. Smaller system are fully skid mounted. Used for intermediate storage of soymilk and dairy products under commercially sterile conditions prior to delivering to an aseptic filler – 5000 L to 20,000 L.